Stewart-Haas Racing stunned the NASCAR world this week with the announcement that they would switch from Team Chevy to Ford Performance for the 2017 NASCAR Sprint Cup Series season. Team co-owner Tony Stewart is a longtime Chevrolet fan and athlete, so the switch to Ford was a shock to many, but he says it was for the good of the team. 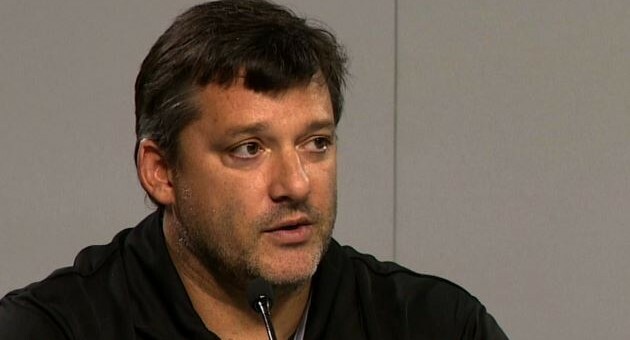 Speaking to media during a teleconference yesterday, Stewart said the decision to switch from Chevrolet engines to Ford was best for the team as it allows them to operate more independently. Right now, SHR buys their engines and chassis from Hendrick Motorsports, but the Ford switch will allow them to do more fabrication in-house. SHR also made the switch to Ford as it was a good business decision, explains Stewart. ‘Smoke’ may be a life-long Chevy guy, but as a business owner, he must always have his employees’ best interests in mind. He thinks the Ford switch can net them more wins and championships, so it’s hard to fault him for wanting what’s best for his brand. Stewart says that for now, SHR is focused on this weekend’s NASCAR Sprint Cup Series race at Atlanta. He added that “at some point we’re gonna (sic) need to start preparing for the transition,” but also said they want to be careful not jeopardize their 2016 season and will continue to vie for a championship under the bowtie banner throughout 2016. Read Stewart’s full transcript from teleconference at this link. I always respected Stewart for speaking his true thought like he did when he was forced to drive the fake engine Toyotas. He stated he is a c Chevy guy and at the end of his contract left Gibbs so he could drive a Chevy, so I don’t think he will ever be a ford guy. Ford is just doing what Toyota does and that is to load the field with Fords so they can luck into a title or I should say buy their way into a title. That being said, I, like a lot of Chevy guys will never cheer for him or ANY driver that drives anything other then a Chevy. I hope Harvick and Busch leave SHR. I like what Rick said and i feel the same way ! I am 69 yrs old man and have been a Chevy guy, sense my Dad taught me how to drive , I will support the Chevy’s till i die !! Bad move will never support him or anyone that drive for his team Chevy rule alway will ……..
Well I really hate to see this happen. My heart sunk when I heard about it as I hate to see anyone leave the brand. But with that said I work in the racing industry and know how hard money is to come by anymore and have seen so many companies having to shut their doors. Moves like this are done to keep relevant and to keep money coming in. This is not like a company where you just go out and make then sell more product. This is where you need to bring in money from MFGs to support the team. Wins do not pay for teams but wins draw attention for sponsorship. The simple fact here is Ford offered them a lot more money than Chevy did and they took it. This is business and nothing personal to anyone. The fact is few people in racing today are willing to write big checks and when someone is willing you need to take it or risk shutting your doors because you turned it down. The one good thing is Danica is now Fords problem. LOL! I was so happy to see Smoke go into Chevy as I’m a fan of all his drivers and especially the Chevy brand. this ford thing isn’t going to change the way I feel about him and his drivers, but, I have never rooted for anything but Chevy. So, here’s my problem, I will root for the drivers I like but hope they don’t win? What’s up with that poop? I was so happy to see Smoke go into Chevy as I’m a fan of all his drivers and especially the Chevy brand. This ford thing isn’t going to change the way I feel about him and his drivers, but, I have never rooted for anything but Chevy. So, here’s my predicament, I will root for the drivers I like but hope they don’t win? What’s up with that poop? After deep thoughts, I came to a conclusion; when Joe Gibbs went with Toyota, I was still rooting for Tony, in fact, I still root for the entire team. I guess that I’m more of a driver fan than the cars they drive. It’s possible that I married my wife because she was perfect for me not so much the bmw she drove.